Hotel Katherineandsurrounds: book online at AccorHotels.com "
Situated in the Northern Territory just south of Darwin, Katherine is a visually stunning and friendly city that is famous for the flowing Katherine River that winds itself through the town. With something for everyone, Katherine is the perfect family getaway. 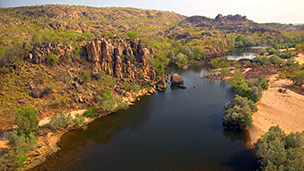 Nitmiluk (Katherine) National Park attracts many visitors with the temptation of bushwalks, swimming holes and canoeing, and Katherine Gorge. The Katherine Hot Springs and Mataranka Thermal Springs are popular draw cards, with visitors finding it the perfect wind-down after an action packed day at the local golf club, BMX trails, and skate park. The surrounding areas of Darwin, Ayers Rock and Alice Springs are also must-visit areas, each with their own unique character and charm. Feel welcome in one of the hotels offered by AccorHotels or our partners at Katherine and surrounds on your next business trip or relaxing family holiday. Whether it’s for one night or an extended stay, take your pick from our selection of comfortable hotels, with somewhere to match any budget.